Dorsal Surface, grey brown to dark brown, often with a darker streak that may run the entire length of the spine. A continuous dark band bordered by light yelow or white spots is often seen on either side of the body. Young, very dark brown or black. The underside of males is brightly coloured usually yellow or orange, but sometimes vermilion and densely covered in black spots. Females have a yellow, grey or greenish occasionally orange underside with few or no spots. 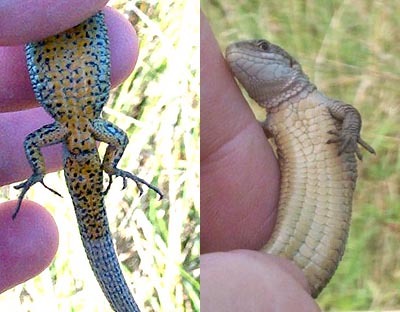 Comparison of male and female Viviparous Lizards Note the dense spotting on the Male and also his re-grown tail. The female has a lighter unspotted belly. Adults emerge from hibernation in March, usually the males are a few weeks earlier than the females. Mating is between April and May. The females produce between 3 and 11 young in July, the young are born in an egg sac that breaks either during birth or soon afterwards. This is why the name "viviparous" is sometimes used, as it means bearing live young, as opposed to laying eggs, which is more usual for lizards. 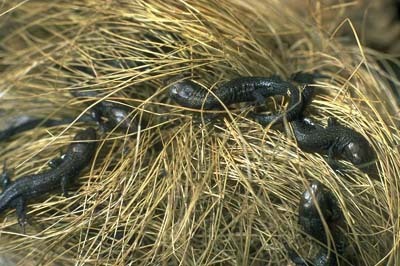 The young are approximately 4 cm long and very dark brown/black in colour. Often they appear to have a dark brown body with a black tail. The Sand Lizard (Lacerta agilis) is of similar appearance but adults are larger, male Sand Lizards may have greenish markings that are not seen in the Common Lizard. 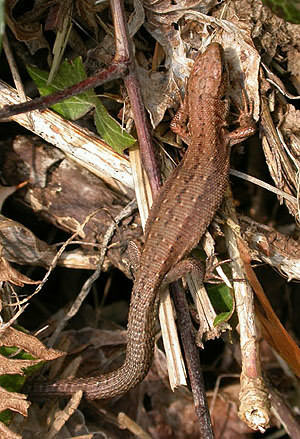 This is an extremely rare Lizard confined to very few sites in the UK. Sometimes Lizards are confused with our native newts. Newts are always very slow moving creatures when on land, during the day they hide in thick grass and under logs and will barely move if disturbed. A lizard will bask in the open in bright sunshine during the warmer months and will move very quickly. In the colder months Common Lizards will also move slowly, but on closer examination they will be seen to be scaly as opposed to having the soft velvety or warty skin of newts. 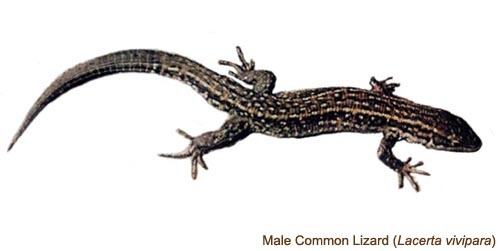 Lizards also have much longer fingers and toes than newts. If you see an animal of this basic shape swimming in the body of a pond, it is a newt. Common Lizard, near Wisley Surrey, 31st July 2003. Showing dark bands on flanks bordered by lighter rows of spots. Also note the dark vertebral stipe, these markings are often present. Where will I see a Common Lizard? 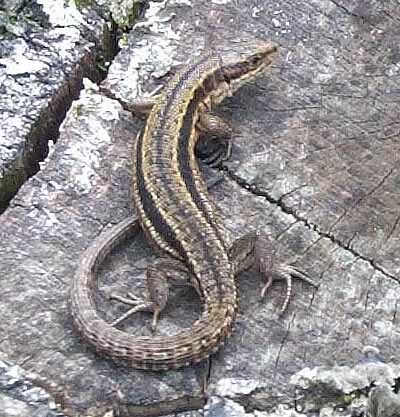 Common Lizards are widely distributed in the UK. You may find one almost anywhere from gardens, heathland, wooded glades, disused railway tracks, open meadows to the banks of ditches and along hedgerows. In spring the males and females bask in the open to absorb the heat from the sun. Later in the summer it is usually only the pregnant females that are seen to bask. They will often use a stone, log or grass tussock close to cover for basking. If disturbed they often return to their favourite spot soon afterwards. 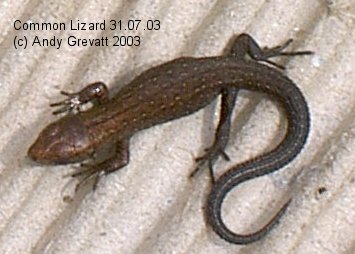 Common Lizard, near Exeter in Devon, 26th March 2003. 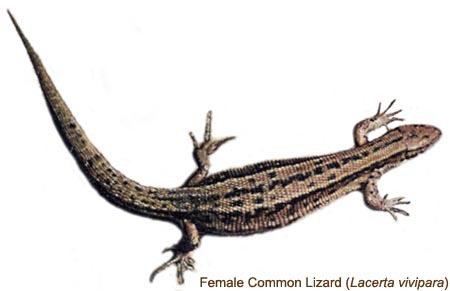 Common Lizards are protected under the Wildlife and Countryside Act 1981.